Grant Meade is currently the Policy Director for State Representative Joe Bellino. Representative Bellino serves as Chair of the House Energy Policy Committee, and as a member on the Committees on Financial Services, Transportation and Infrastructure, and Insurance. Grant is a 2016 graduate of Central Michigan University where he received a BA in Political Science with a minor in Communications. 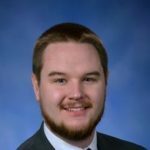 He has 3 years of experience in state government and started his career in Former Speaker of the House Kevin Cotter’s office.